The Mercedes-Benz M-Class won't be on sale for too long. Instead, the refreshed version will roll out as the GLE. This is part of the new Mercedes nomenclature. All SUVs in the lineup (save for the G-Class) will soon use the GL prefix followed by a letter representing the Mercedes car it's based upon - for instance, the GLA is based on the A-Class hatchback. The all-new C-Class based GLC has just been unveiled globally and the flagship, GLS, premieres end of this year. 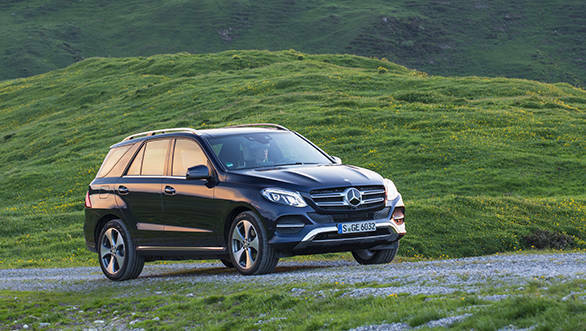 It's clear that 2015 has been an SUV special for Mercedes-Benz. While the GLC and GLS won't make it to India this year, the GLE will. We just drove the new SUV around the Alps in Austria and Germany. Is it a worthy successor to the M-Class? We find out. 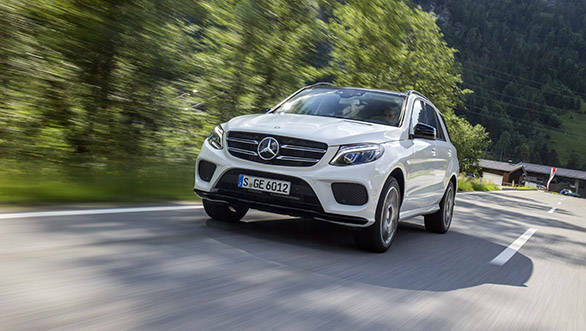 The new GLE adds some more appeal to the current generation M-Class which has been around for some time now and is still one of the best selling Mercedes-Benz cars in India today. This has been possible thanks to the new face. It's more in sync with its sedan siblings. 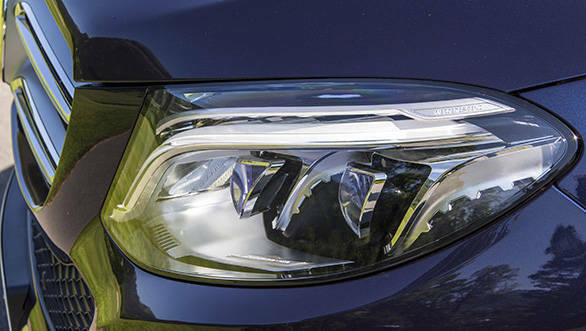 The headlights, for instance, have been redesigned and feature the new style LED DRLs and lamps. The front grille and bonnet are new and so is the front bumper. While the regular variants use the standard bumper, there's a special variant that gets the AMG styling kit like the one you see here. It's a lot more sporty and aggressive. The larger front air dam and the lower bumper/side skirts add to the stance. Light 20-inch AMG wheels are also part of the package. This trim might actually make it to the top-end diesel variant, albeit without the low profile wheels. The sides and rear meanwhile receive very few changes which are barely noticeable. Inside the GLE, the layout is more or less like the M-Class but there are a few vital changes made to give it a new feel. The steering wheel is the newer design unit and features easier and larger controls while being better to grip. The centre console gets a larger and higher resolution 7-inch screen. There are many more features included too thanks to the latest COMAND interface. Graphical representation of almost all functions is easily the best we've seen in a Mercedes SUV so far. 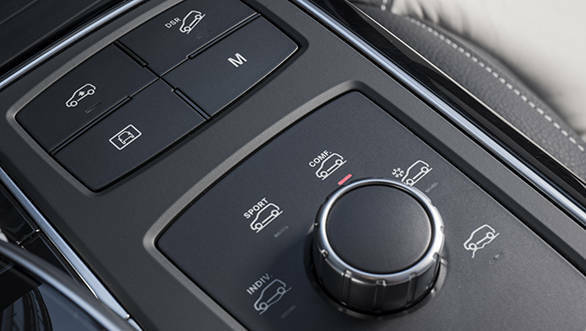 The control knob is larger and there's also a touchpad like in the C- and S-Class. Add to this, a knob for the various drive modes. The interior gets new colour options and inserts. Cabin space is good and since the GLE is technically an updated M-Class, interior dimensions remain the same. 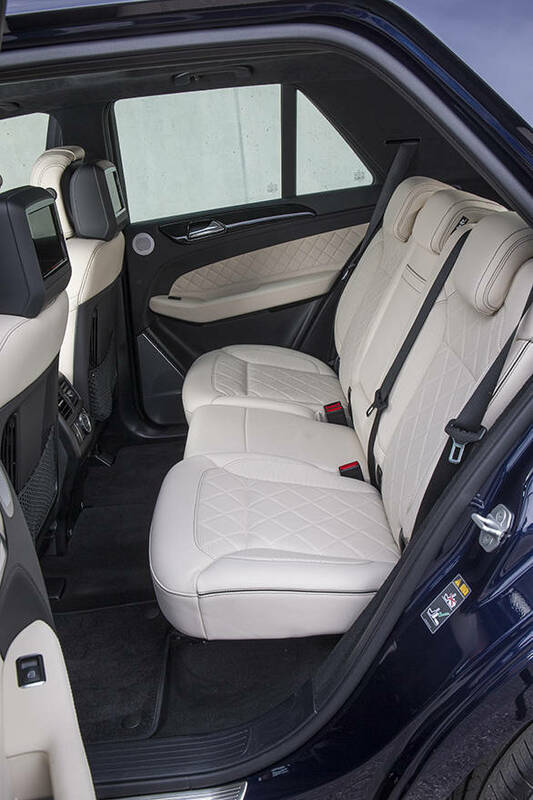 Unlike the X5 that also offers an optional third row of seats, the GLE is strictly a five-seater. The GLE internationally will be offered with various engine options, including a plug-in hybrid option (a first for a Mercedes SUV) and an AMG GLE 63 performance version. India will most probably get the GLE 250 d, 350 d and the GLE 63. The 250 d and 350 d models will replace the current ML 250 CDI and ML 350 CDI respectively. The proven 2.1-litre and 3.0-litre diesels have been retained but get a few updates. On paper, the power figures are identical to the models the GLE replaces (204PS and 258PS) but claimed efficiency has gone up due to the start/stop function and an optimised turbocharger. In the 350 d, there are further upgrades like a different ECU and a new oil pump to further improve fuel efficiency. The most significant change, however, is the new 9-speed automatic transmission, successor to the 7-speed unit seen before. The gearshifts are smoother and power delivery is better too. The torque spread is better managed and goes well with the nature of the updated diesel engines. The GLE 500e 4Matic is the plug-in hybrid model. 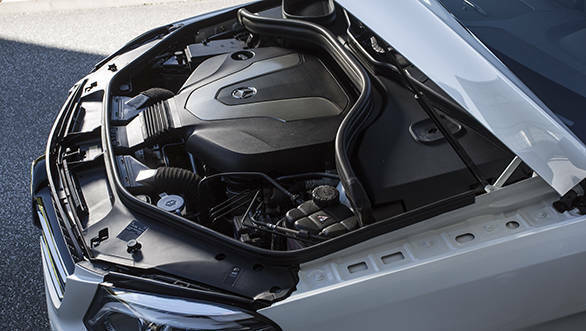 It features the 3.0-litre V6 petrol motor that produces 333PS of max power and an hybrid module that puts out 85kW or 116PS. 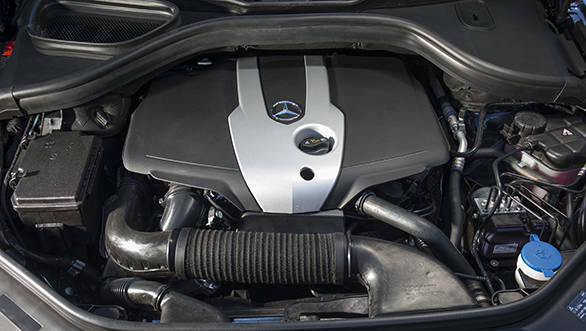 This combination puts out an impressive 442PS of max power and 650Nm of peak torque. There are four driving modes on offer  Hybrid, e-mode, e-save and Charge. In Hybrid mode, the system automatically selects an operating mode with the combustion engine and/or electric motor depending on the situation. In the e-mode, one can drive completely on electric power - we drove up to 30km before the battery was fully drained. The e-save option preserves the battery charge to be able to drive on all-electric power later on. Charge mode, as the name suggests, can be used when the battery needs to be charged while driving or when stationary. Top speed in electric mode is a claimed 120kmph. We managed 100kmph without the combustion engine intervening. The hybrid will make sense in India if it is priced close to the diesel variant. However, Mercedes-Benz says that there are no plans to introduce this variant in India yet. In terms of handling, the GLE is very similar in character to the current M-Class. It is stable on the highway even at higher speeds and quite capable around corners too. 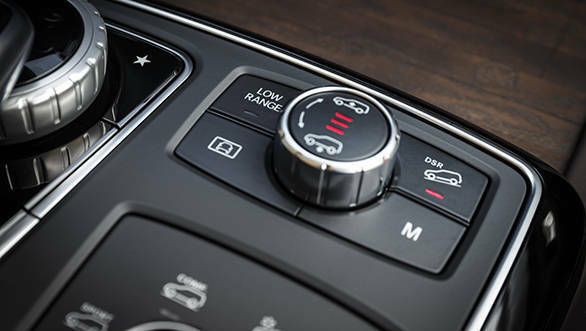 There are various driving modes that are part of the Dynamic Select Control System (Comfort, Slippery, Sport and Individual). The GLE also gets optional air suspension. This variant also gets an Off-road mode that increases ride height. Then there is the off-road engineering package that adds the Off-road+ mode. This variant gets a low-ratio option and a 100 per cent inter-axle differential lock, ride height can be further increased to 285mm. 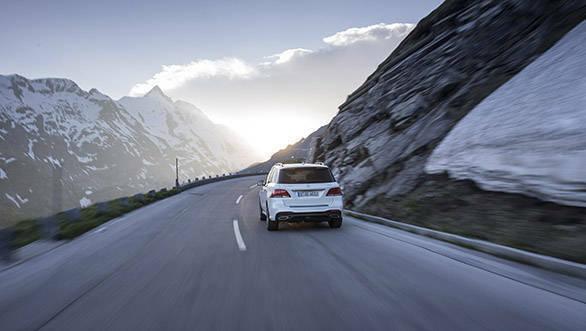 This GLE is ideal for thoselooking for better off-road performance. Special off-road algorithms ensure that the ABS, traction control and ESP settings aid traction. We tested the off-road capabilities on a special test track that included 65-degree declines, rocky patches that went uphill and deep moguls - all of which the GLE managed with ease. The new interface of the Mercedes COMAND system also displays various off-road animations such as slopes, tilt angles and steering angles in real time. The upcoming GLC may also offer this feature. The GLE may look like a refreshed M-Class but it actually incorporates the latest Mercedes-Benz technologies and updates. While India won't get all the engine options, the 250 d and 350 d diesel options offer a good balance between power and efficiency and should also feature the new generation 9-speed transmssion. There are additional styling and comfort features too, adding to the overall appeal. The GLE will roll out end of this year and will be priced slightly more than the current M-Class. However it will still be worth the wait.